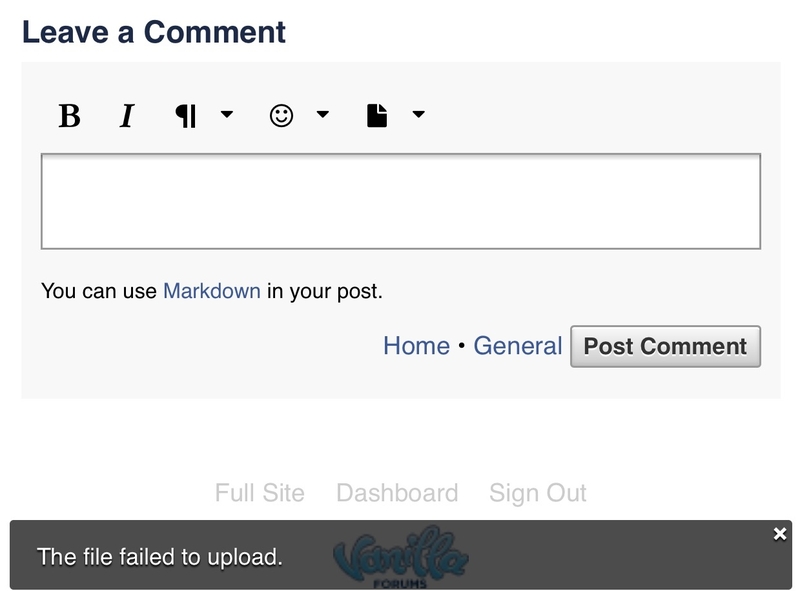 Discussion "Failed to upload" when uploading a picture? "Failed to upload" when uploading a picture? The file uploader built into our forum is temperamental, many photos (vast majority) won't upload - I think it's possible down to file size but have no way to verify it for sure. In the php.ini file the maximum size is 20M so I don't think it's that. Did you try watching it as you upload it, with developer browser console open? Click the Network tabs and the Console tabs and see what's happening during the upload. As I'm fairly new on this forum, I can only give answers as to what works on most scripts. In a lot of cases, folder permissions come into play when things won't upload. JS conflicts can play a part (though I need more time playing with Vanilla to see how it uploads). I don't have a file uploader on my forum so it'll be a little harder to test things as we don't allow it for security reasons. Is it in the advanced editor? Is it a plugin? Did you make something? Perhaps one of the gurus here will know exactly what you are using. Til then, I'm just trying to help you troubleshoot. Thank you very much! I'm on mobile right now but I'll check as soon as I can get on a PC. Based on more testing I'm 100% sure it's due to file sizes. Images below 2mb seem to upload fine but nothing bigger. not sure if this will fix the problem in mobile - but you can try it. CHECK the php values regarding - each one has an impact. what is the value in your config.php for Garden.Upload.MaxFileSize. if you don't have the statement, It will be set to 50M by the default in config-defaults.php (which is sufficient). to the size you want. some problems are regarding gd - not installed when upgrading php - see phpinfo. Test uploading a 2MB zip file vs. 2MB image file. If both fail it is a size setting. If one fails and the other doesn't it is probably a memory issue or a gd issue and NOT a folder problem and not a Garden.Upload.MaxFileSize or a client_max_body_size or a post_max_size or a upload_max_filesize. you may need to increase your memory_limit to 128M or higher that is allowed. Blize said:In the php.ini file the maximum size is 20M so I don't think it's that. maximum size is not a variable! be specific when you can be. are you are reading the correct php.ini ? check with phpinfo. I've just upgraded to the latest version - 2.2.1 - so I think I've posted this in the wrong category but I can't figure out how to change it. Is it just a case of waiting for a stable 2.3 release, or is there something I can change in the mean time? You also need to be aware of this if you want things to function properly. Both of these setting are available from the Advanced Editor Settings page thru the dropdown boxes. Make sure you reload the browser and anything that might cache your js, so the changes you make to the js will be reflected.